Update March 28, 2018: Planet Coaster’s studios pack is out now. Theme parks and movies go together like peanut butter and paté (rogue suggestion, but trust me), with some of the world’s best parks operated by movie studios, and themed after their properties. Now you, too, can emulate this tradition in Planet Coaster. Want to marvel at cool things? Look at the best Planet Coaster creations. 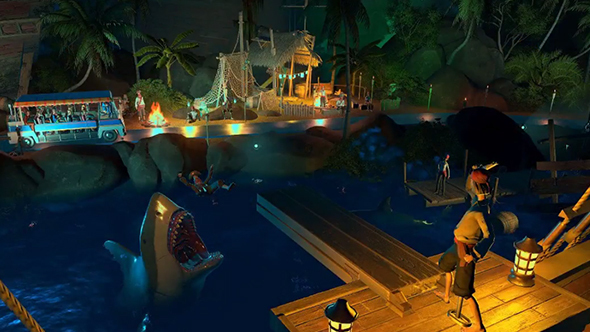 Planet Coaster’s Studios Pack is on Steam hereand addsa ton of movie-themed attractions, some of which are clearly inspired by real rides. This screenshot, for instance, reminds me of the Jaws ride at Universal Studios in Florida, while the new Horror Heights tower cribs from the Twilight Zone Tower of Terror at Walt Disney World (also Florida). The latest DLC, like all previous content packs, will set you back £7.99 or $/€10.99. Original story March 21, 2018:Planet Coaster is getting star-struck, with a film-themed new bit of DLC set to launch next week. Your parks will get a bit of movie-like flair with backlot appropriate new attractions, including some new rides geared toward a darker flavour. It’s all perfect if you want your park to be a little more Universal Studios than Disney World. The new rides include Horror Heights, a multi-drop tower built to work indoors, and one which bears a striking resemblance to the Tower of Terror. There’s also Big Screen Tour, a powered track ride meant to simulate a backlot studio tour, and Re-Motion, a simulator-style track ride with an adjustable robot arm and parabolic screens. There’ll also be new special effects, stuntmen, breaking windows, animatronics, vehicles, and props. A new wall set and construction props will help you tie together diverse styles with a proper backlot theme. Studios Pack launches on March 27 for $10.99 / £7.99 / €10.99. That’s the same price as previous Planet Coaster DLC add-ons like the Spooky Pack and Adventure Pack. In addition to the DLC, a free update will also add some new features for all players. You’ll be able to manage hotels to host your guests, place path-shaped holes in terrain, and add triggerable colours to objects. Plus there are more pieces – and glass.